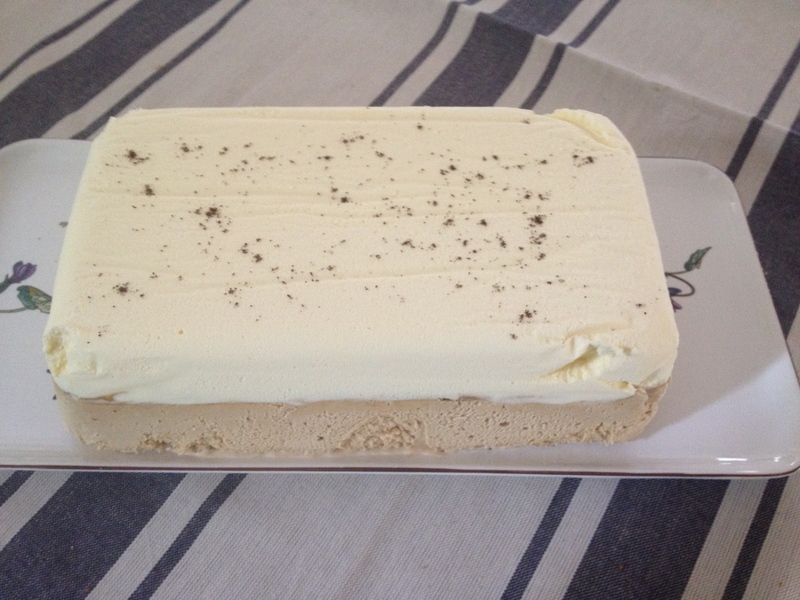 Few weeks ago, in a previous post, I showed you pictures of my Coffee-Ginger Semifreddo and I promised my recipe. With outside temperature reaching 105 degrees, here it is the perfect treat for these scorching days of Summer. 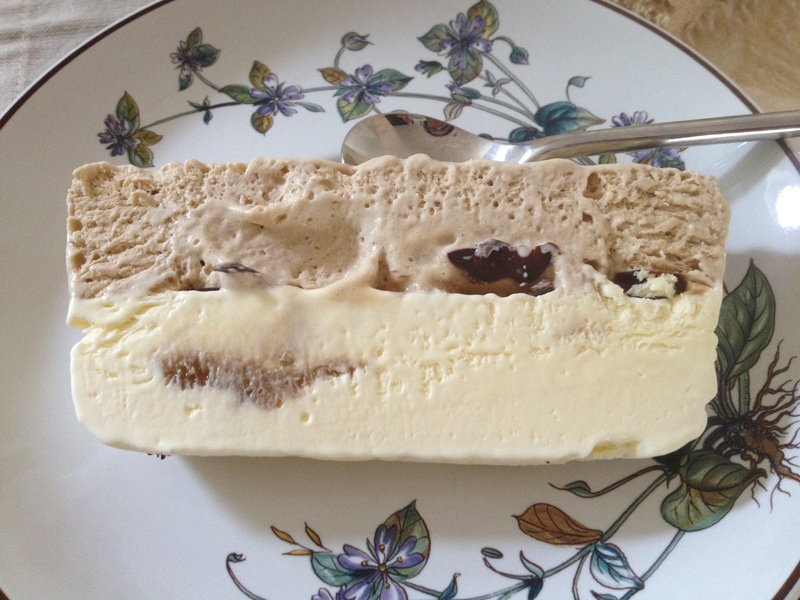 Semifreddo (literally half-cold) is a semi-frozen dessert, predecessor of the gelato. It is defined as “ dolce al cucchiaio” (dessert for spoon) and it is best served at a temperature between 14-21 degree. 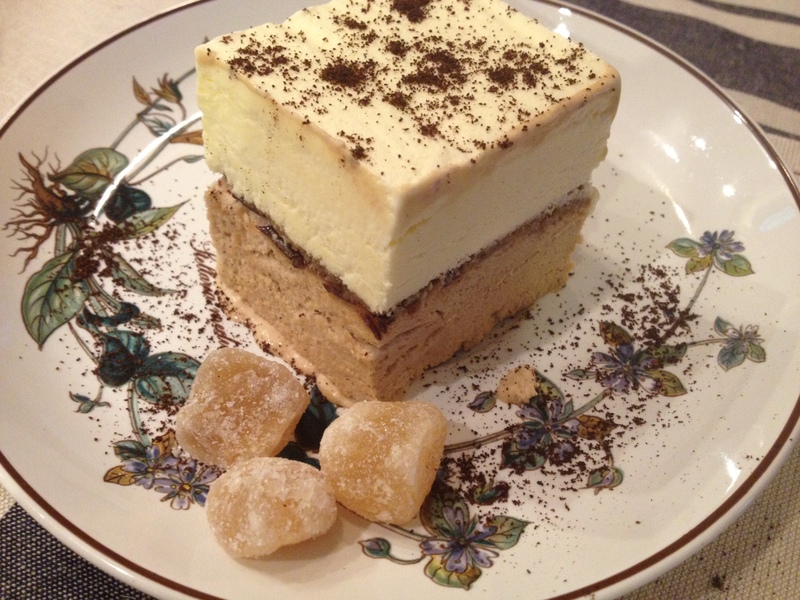 NOTE: The recipe is divided into two sections: ginger semifreddo and coffee semifreddo. 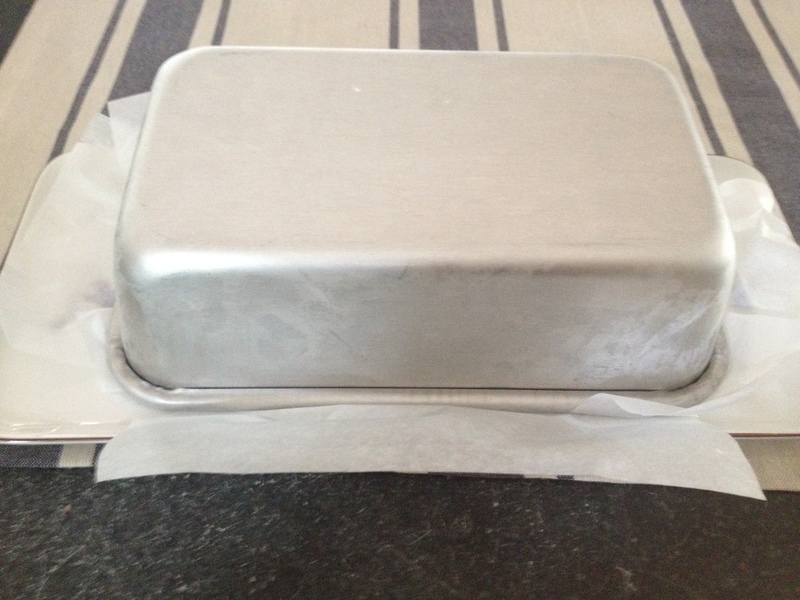 Spray a 9 by 5 by 3-inch metal loaf pan with non-stick spray. 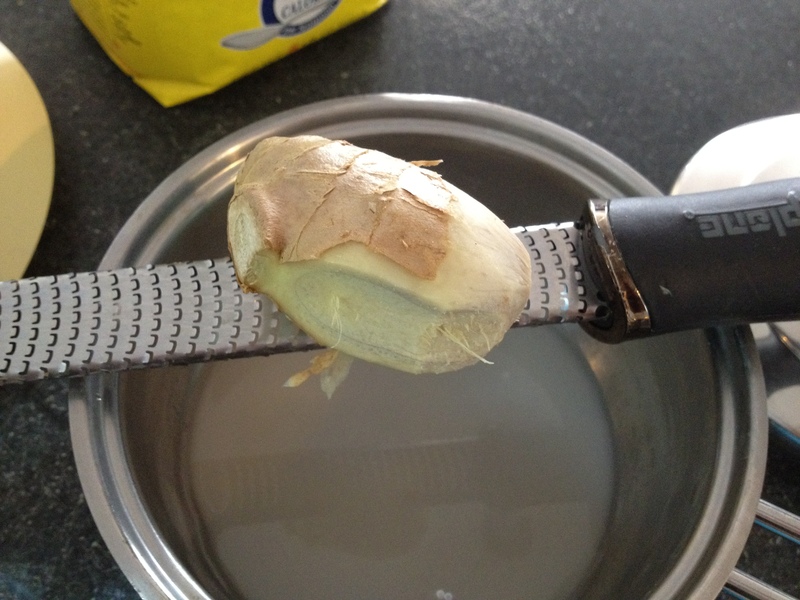 Line the pan with plastic wrap or parchment paper allowing the excess to hang over the ends and sides. First make the ginger syrup. In a small pan melt (on low heat) 6-1/3 tablespoons of sugar with 4 tablespoon of water and 2 tablespoon of freshly grated ginger. Let simmer for five minutes, remove from stove and let steep for five more minutes. 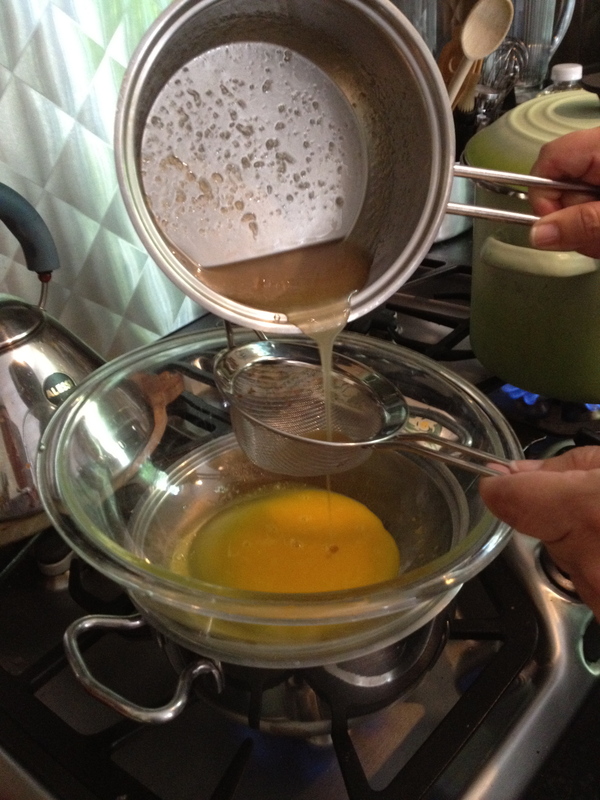 In a medium glass bowl, break the egg yolks with a fork; passing through a sieve, add the ginger syrup and a pinch of salt and whisk together until smooth. Put the bowl over a pan of simmering water, making sure the bottom of the bowl does not touch the water. 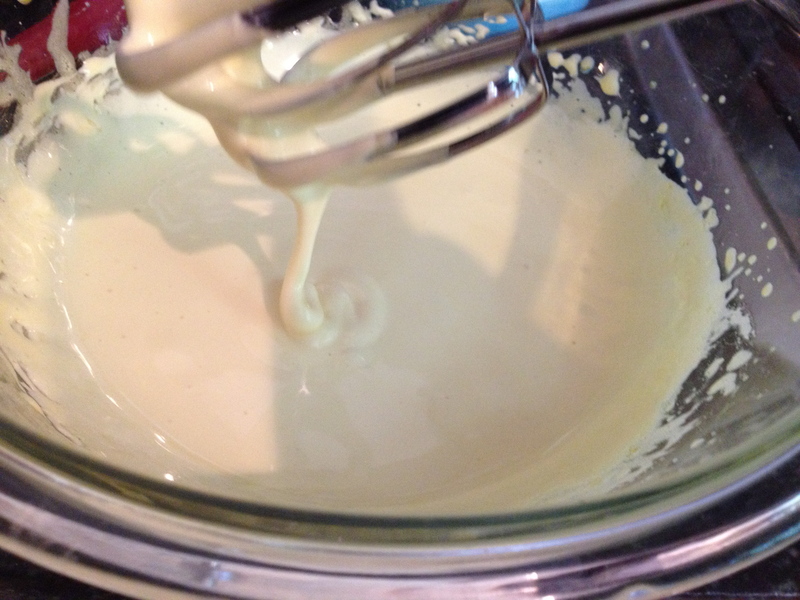 Whisk until the egg mixture is pale, thick and creamy, about 10 to 15 minutes. Put the bowl into a larger bowl of iced water and with an hand held electric mixer beat until fluffy and completely cool. 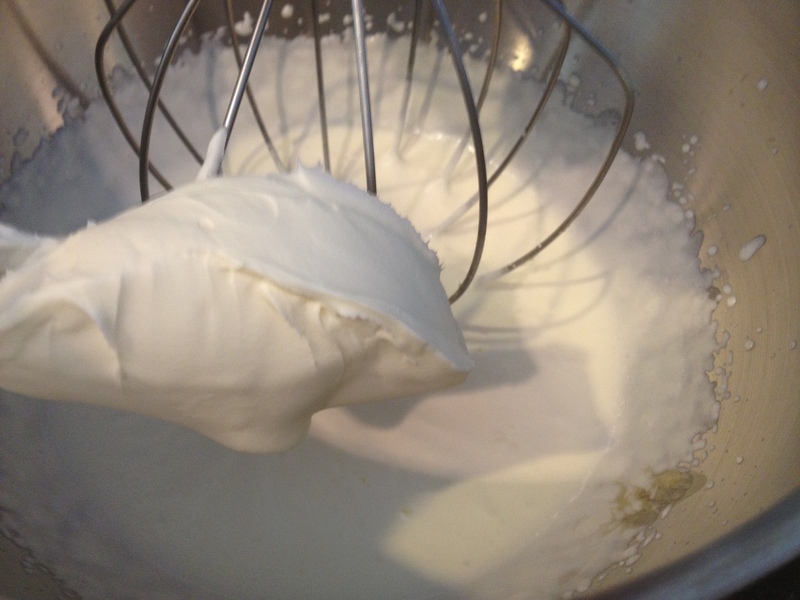 In the bowl of a standing electric mixer fitted with the whisk attachment, beat the 3/4 cup of heavy cream with the mascarpone and the remaining sugar at medium-high speed until soft peaks begin to form. Start folding the whipped cream-mascarpone mixture into the cooled egg-yolk mixture (do not pour all at once, start with 1/4, fold it in then add more) and with a spatula mix gently until no streaks remain. 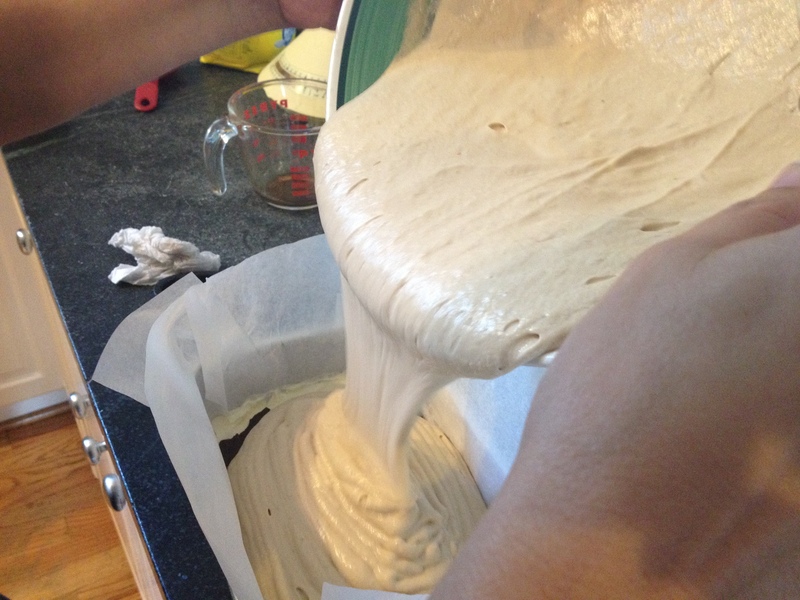 Spoon the mixture onto the prepared loaf pan, spreading in an even layer. Oops, forgot to take picture . . . this is the second layer! 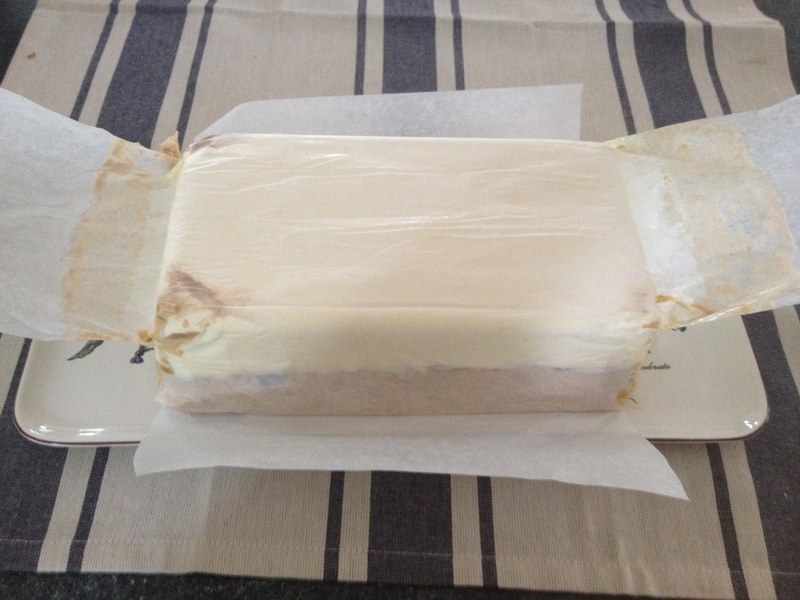 Press plastic wrap directly onto the surface of the semifreddo and place into freezer for one hour. 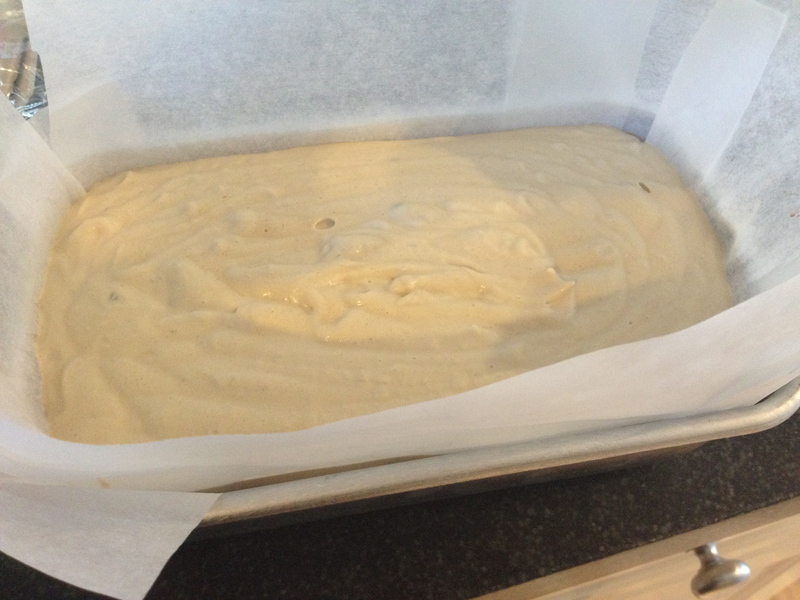 SECOND STEP: Preparing the coffee semifreddo. Time the second step of the semifreddo so that the coffee semifreddo will be ready for the freezer not before the one hour mark from the time you place the ginger semifreddo into the freezer. 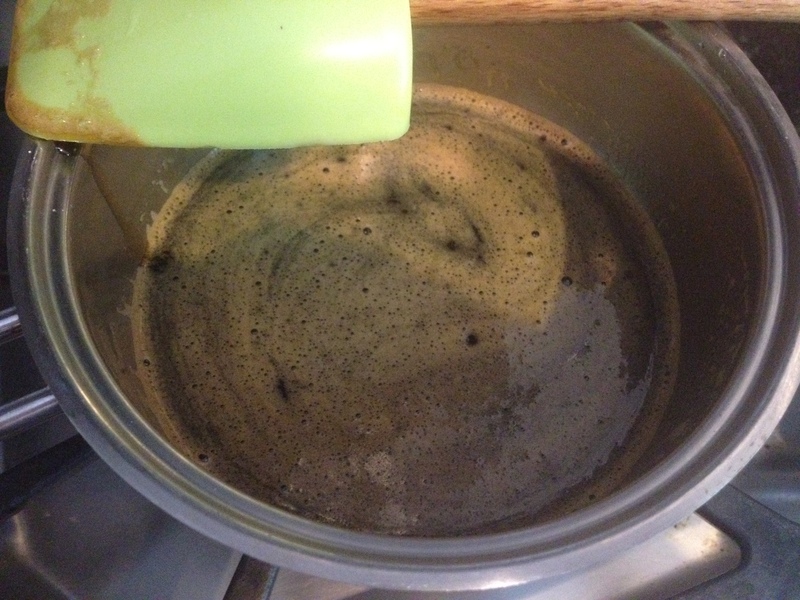 In a small pan melt (on low heat) 6 -1/3 tablespoons of sugar with the ¼ cup of espresso. Bring to boil and then simmer for five minutes, remove from stove and let cool. Repeat same step you followed for ginger semifreddo: In a medium glass bowl, break the egg yolks with a fork; add a pinch of salt and start whisk while slowly pouring the coffee syrup. Put the bowl over a pan of simmering water, making sure the bottom of the bowl does not touch the water. 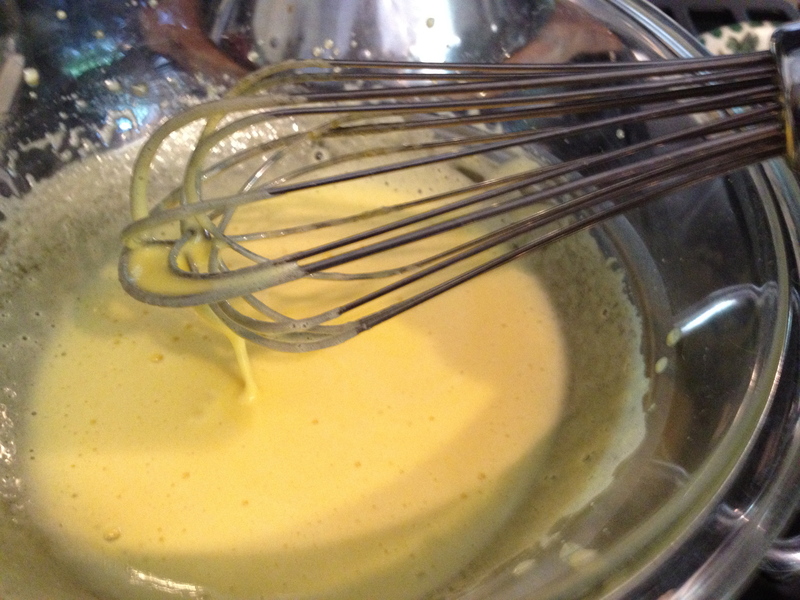 Whisk until the egg mixture is, thick and creamy, about 10 to 15 minutes. Put the bowl into a larger bowl of iced water to cool completely. 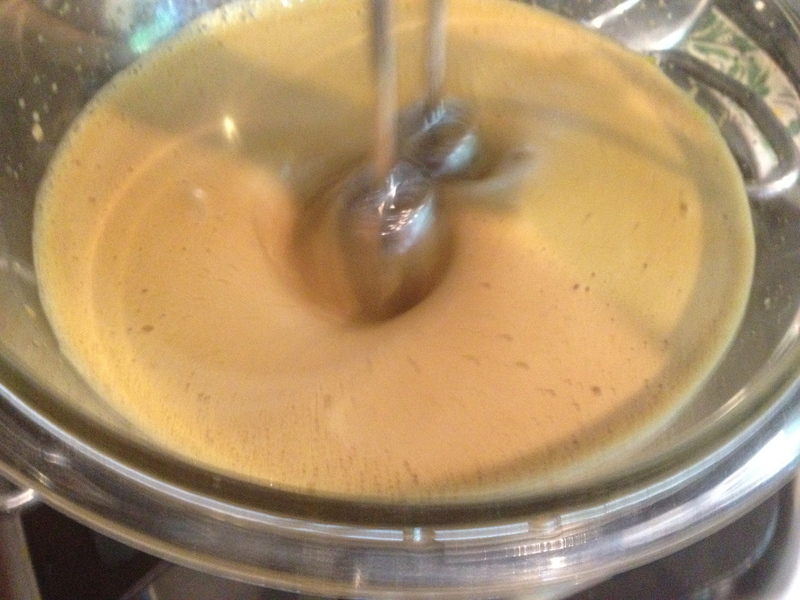 Use the hand held electric mixer to beat the coffee cream until light and fluffy. 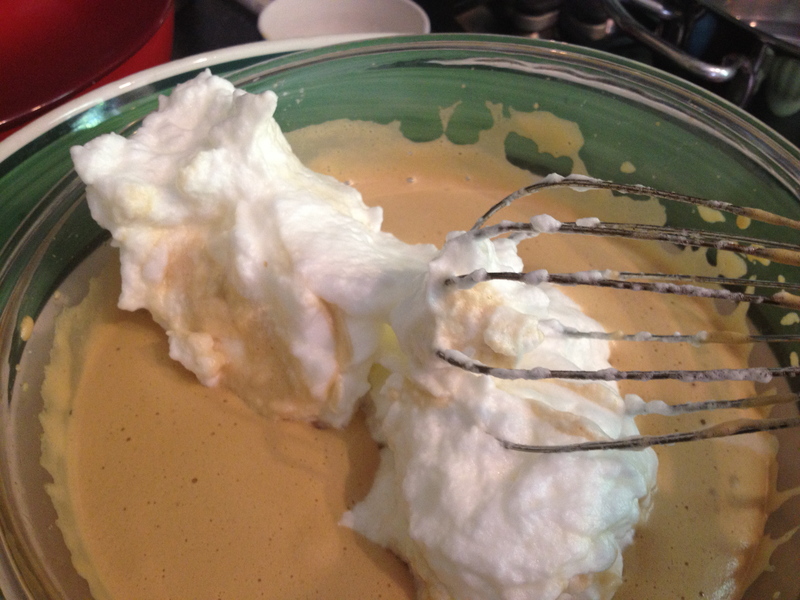 In the bowl of a standing electric mixer fitted with the whisk attachment, beat the egg whites with 3 tablespoons of sugar (also add a pinch of salt) until firm, like meringue. Gently fold the egg whites into the coffee cream. 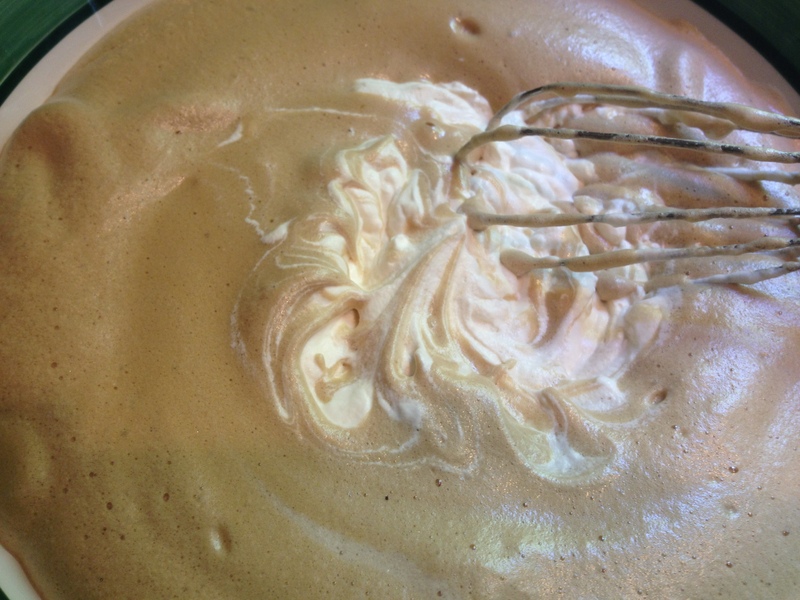 In the bowl of a standing electric mixer fitted with the whisk attachment, beat the heavy cream and the remaining sugar, until soft peaks form. 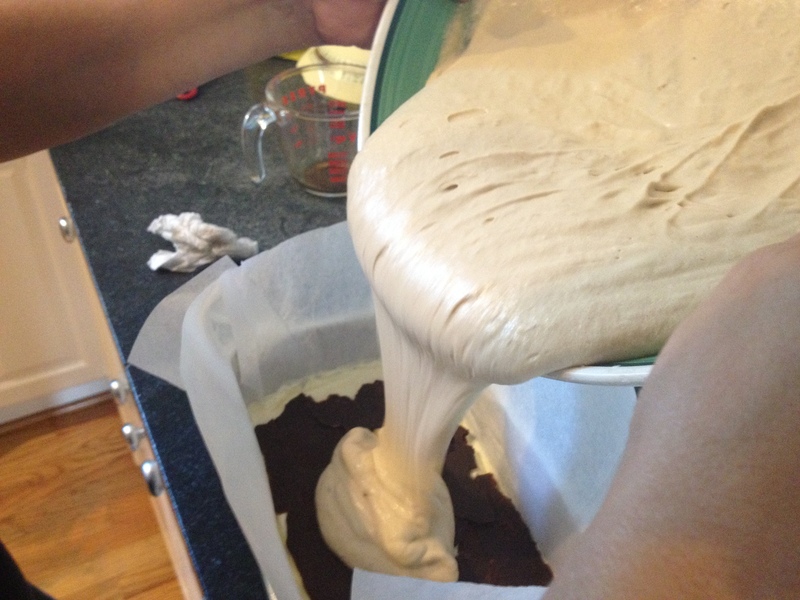 Fold the cream into the coffee mixture and with a spatula mix gently until no streaks remain. Remove the ginger semifreddo from the freezer, remove the plastic film from the top and quickly Spoon the coffee mixture over the ginger semifreddo. Spread in an even layer, Press plastic wrap directly onto the surface of the semifreddo and place into freezer for at least 4 hours. Remove the plastic wrap. 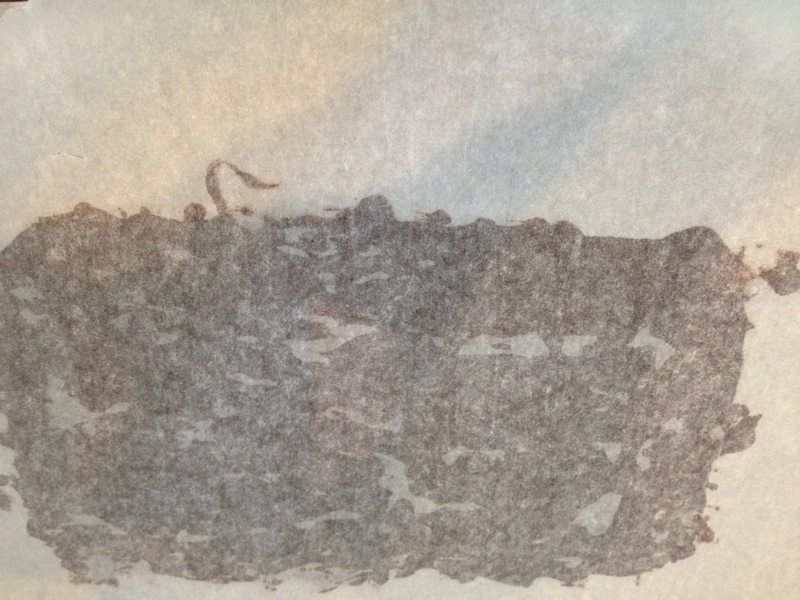 Invert the semifreddo onto a platter and peel off the parchment paper. 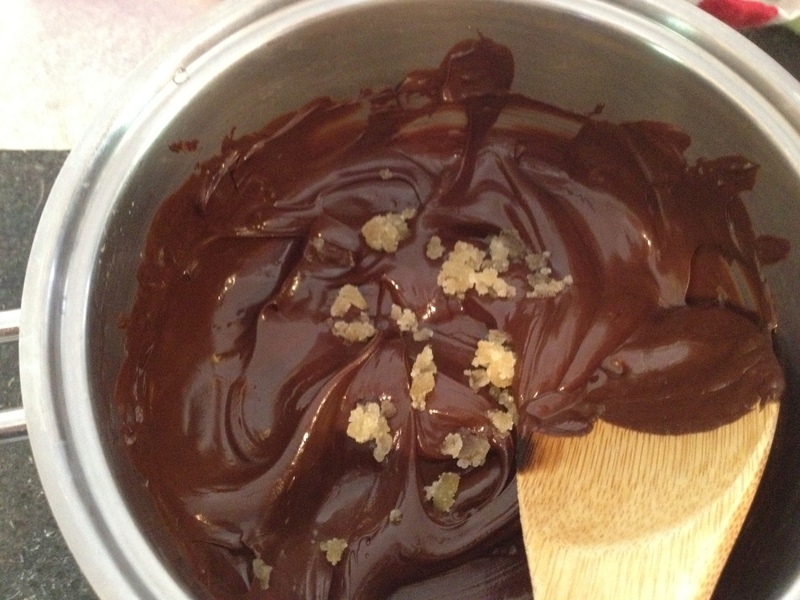 You can sprinkle the top with finely chopped crystallized ginger, a dust of ground coffee or dark unsweetened chocolate powder. Cut the semifreddo into 1-inch slices or 2-inches squares and serve. NOTE: You can add an ingredient of your choice between the two layers of semifreddo, such as crushed amaretti, chocolate covered coffee beans, ground crystallized ginger, and so on. 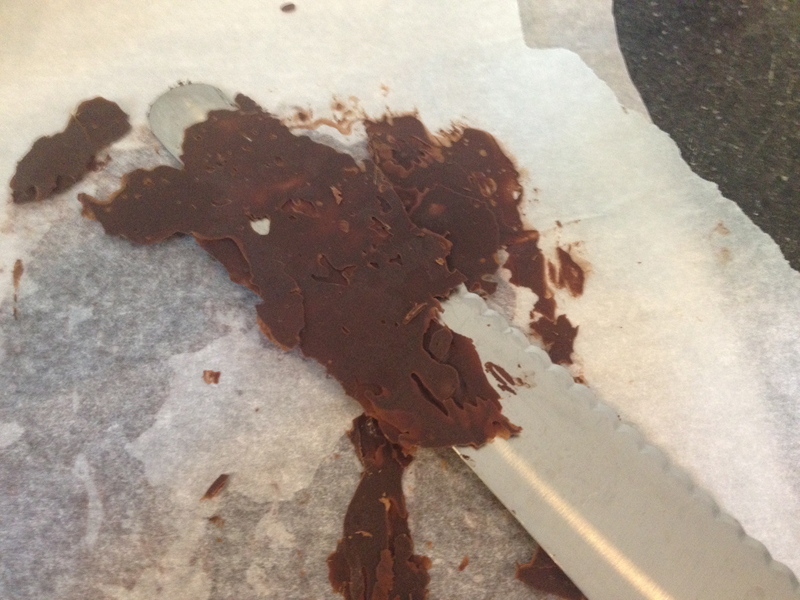 I tried to prepare a sheet of dark chocolate but I need to work on this preparation a little more, I will, however, show you my attempt. 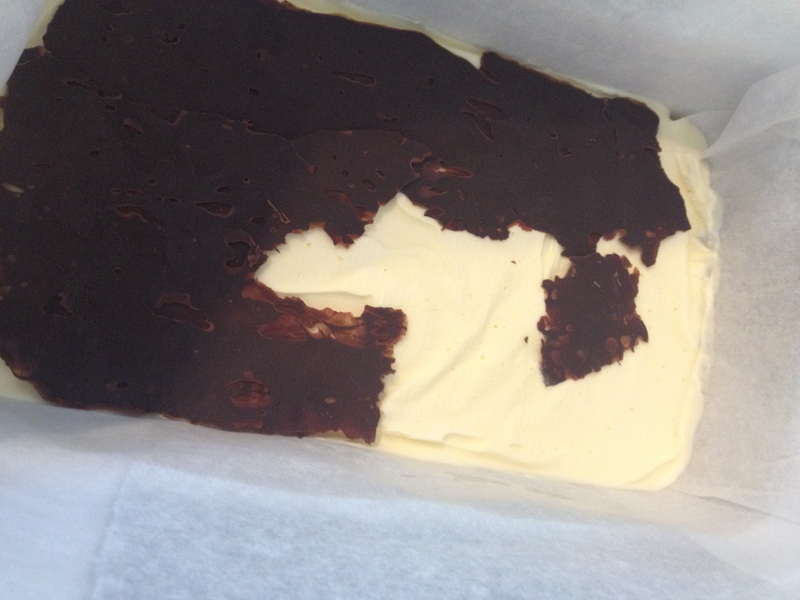 It was my intention to create two sheets of dark chocolate, one to line the bottom of the loaf pan (it would then become the top of the semifreddo) and one between the two layers of semifreddo. 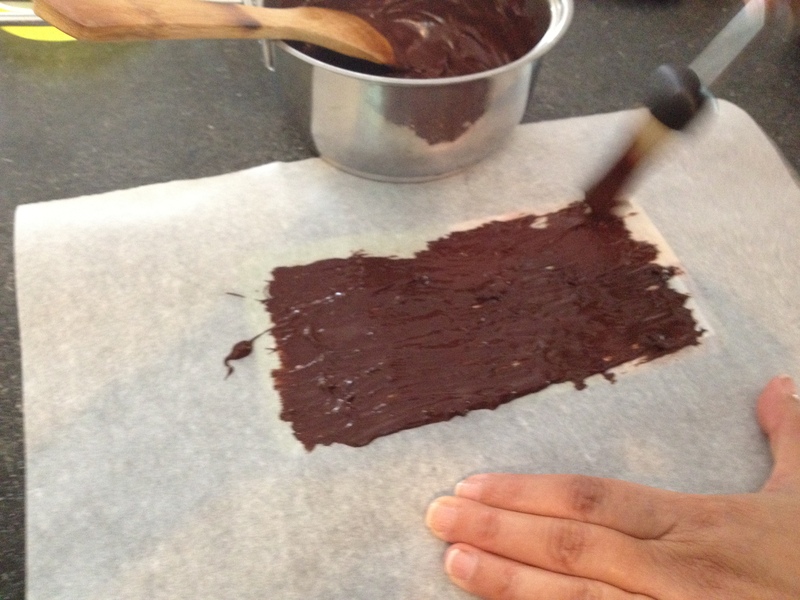 I gave up to the bottom part as I could not get a clean-cut of the sheet of chocolate. 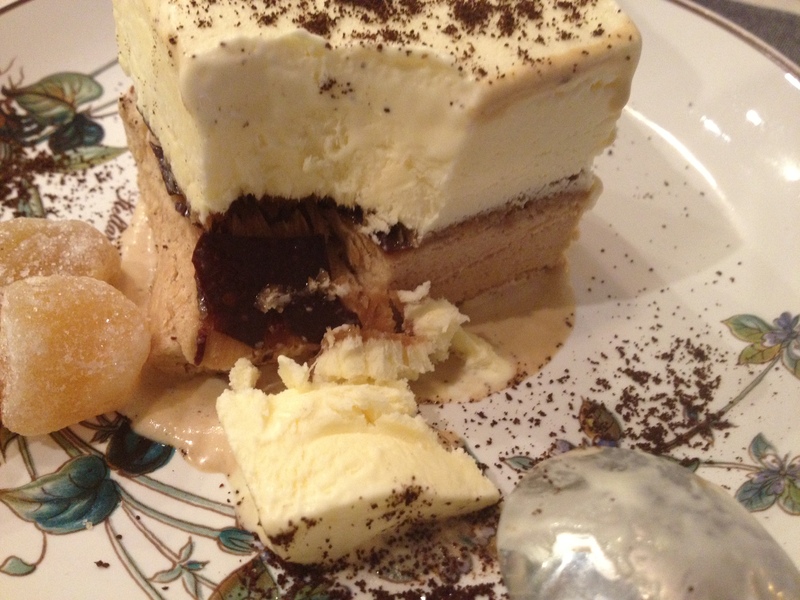 I did, however, use the pieces of chocolate’s sheet between the two layers of semifreddo. I figure that none would know that it was not perfect . . . I forgot that the whole world would know after reading my blog! 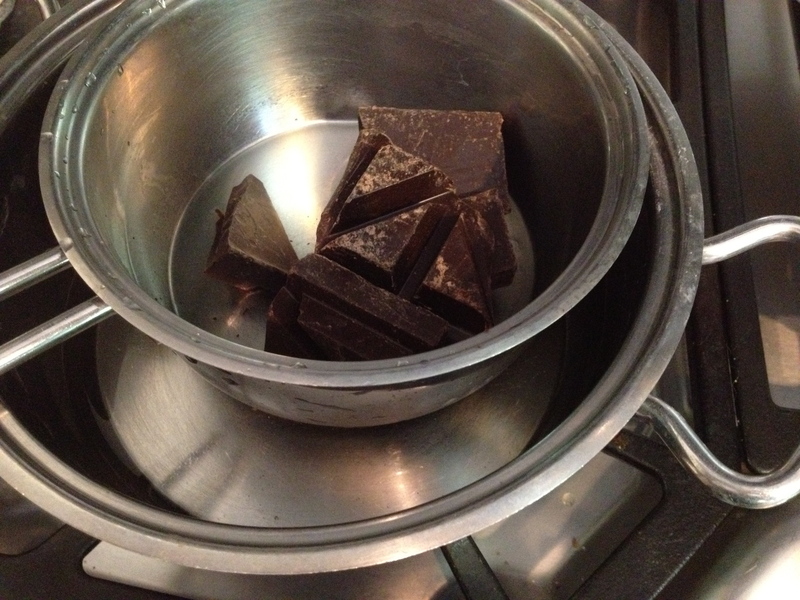 Melt some dark chocolate in a small pan sitting on top of pan with simmering water. 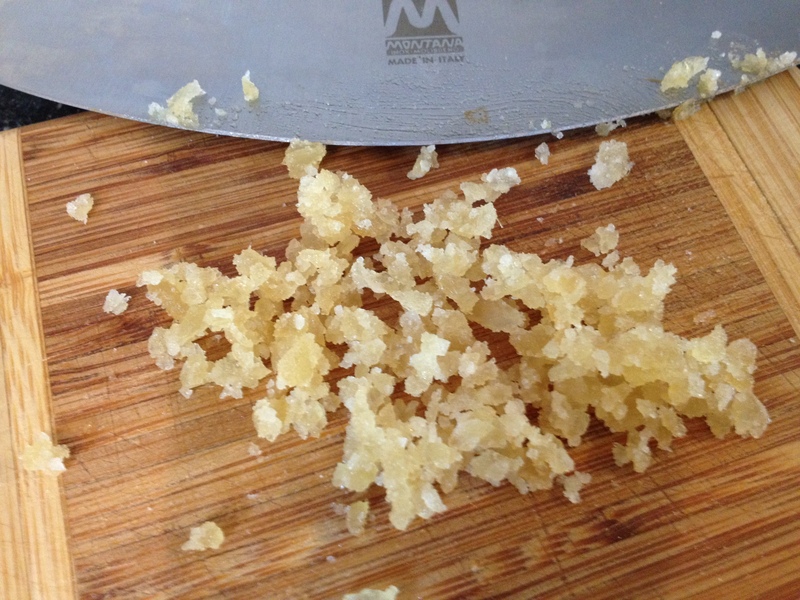 Add some chopped crystallized ginger. 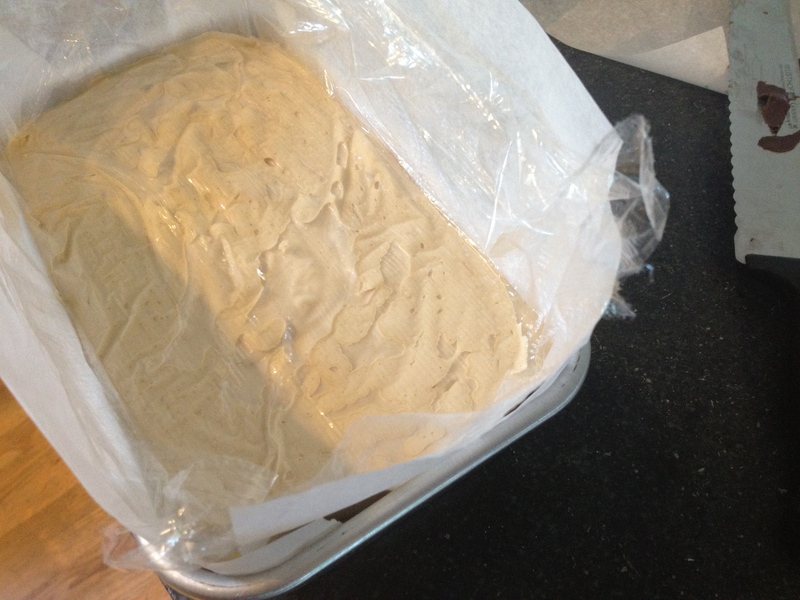 Spread the mixture about 1/8 inch thick on parchment paper. 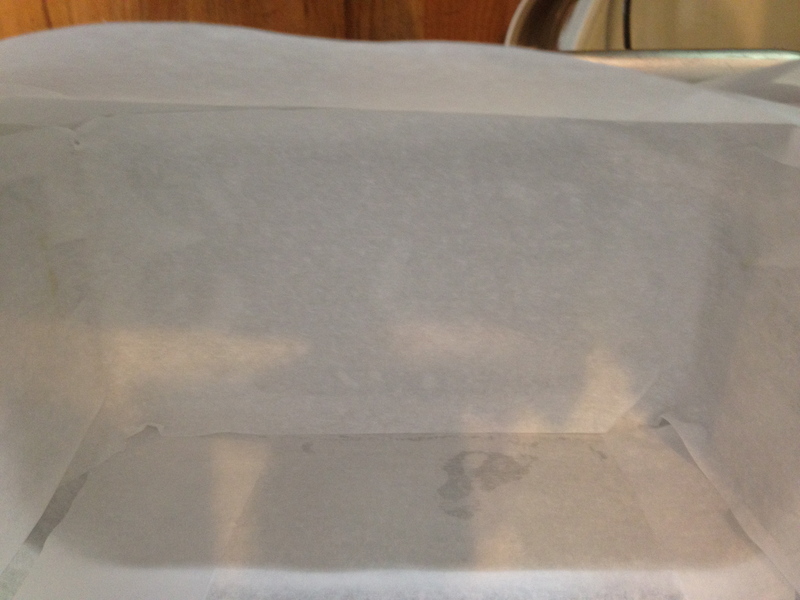 Cover with parchment paper and chill in the refrigerator until no longer soft, but not hard. Using a sharp knife I tried to make a clean-cut. Clean cuts? Not this time! As you can see I was not successful so I only used the cutouts in the middle of the semifreddo. I will keep practicing and I will share more tips. For now enjoy my scrumptious semifreddo! DETAILS ARE HERE, SHARE IT WITH YOUR FRIENDS! A Recipe from Sicily . . . Pesto Trapanese. Hi! Your semifreddo recipe was nominated as one of the “Best 300 Semifreddo Recipes on the Net”. To vote for it, please visit http://easyitalianrecipes.org/dessert-recipes/best-300-italian-semifreddo-recipes-on-the-net-vote-for-your-favorite/ – your recipe is positioned at #46 (random order). Thank you so much…I am truly honored!!! Thank you Robin . . . It is so nice of you! I am honored! LOL… you are not the first one to ask! no, I am sure I am not…amazing! Could you just Fed Ex it to me NOW?!?!?!? LOL! Love your blog. I’ve just started one about many things Italian – mainly cooking and family – called ‘The Good, the Bad and the Italian’. Brings back memories as I write. Thank you, I glad you like it. Looking forward to read your stories . . . good luck! It looks so delicious and refreshing – perfect for a hot summer day! It is indeed very delicious . . . I am trying pistachios next week! looks great..and sorry for my ignorance but what is HEAVY CREAM?..is it creme fraiche? or is it whipping cream? Heavy cream is also called “heavy whipping cream”. May be I should clarify that, thanks for bringing to my attention. That looks fabulous! So different, so easy–and a make ahead dessert, besides. Wow! And it is sooo good . . . really!